The bestselling author of Complications examines, in riveting accounts of medical failure and triumph, how success is achieved in a complex and risk-filled profession. The struggle to perform well is universal: each of us faces fatigue, limited resources, and imperfect abilities in whatever we do. But nowhere is the drive to do better more important than in medicine, where lives may be on the line with every decision. In his new book, Atul Gawande explores how doctors strive to close the gap between best intentions and actual performance in the face of obstacles that sometimes seem insurmountable. Gawande's gripping stories of diligence, ingenuity, and what it means to do right by people take us to battlefield surgical tents in Iraq, labor and delivery rooms in Boston, a polio outbreak in India, and malpractice courtrooms around the country. He discusses the ethical dilemmas of doctors' participation in lethal injections, examines the influence of money on modern medicine, and recounts the astoundingly contentious history of hand washing. 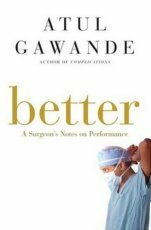 And as in all his writing, Gawande gives us an inside look at his own life as a surgeon, offering a searingly honest firsthand account of work in a field where mistakes are both unavoidable and unthinkable. At once unflinching and compassionate, Better is an exhilarating journey narrated by "a writer with a scalpel pen and an X-ray eye" (Time). Gawande's investigation into medical professionals and how they progress from good to great provides rare insight into the elements of success, illuminating every area of human endeavor.